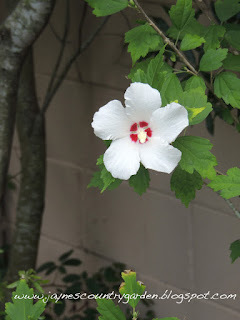 My Flower Friday post is a day late, but not a silver dollar short! Since July 4th falls on a Monday when the newspaper has to be built, our boss closed the office yesterday instead to celebrate Independence Day. I took the day off from blogging, as well, and traveled an hour away with my mom to visit a friend we've known since I was in grade school. And now I'm exercising my freedom to post yet another triumph tulip from Longwood Gardens, even though I photographed these wonderful white petals back in April. Have a happy holiday weekend! That is gorgeous. So fresh looking! Used to love dandelion seeds in the wind. I love the dew drops on it. It's suppose to rain here this evening. We sure could use it. 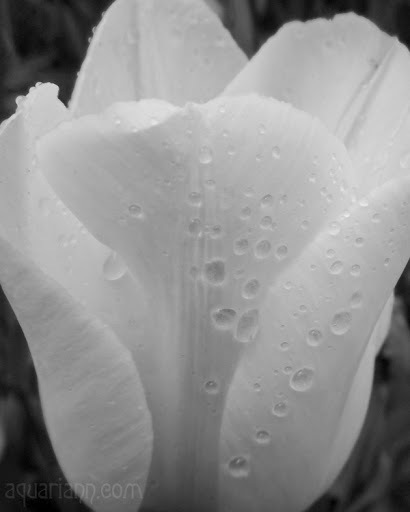 Very pretty white flower - I love the water droplets on it too. I wish we had tulips here. That photo is so lush! The b&w effect made is more dramatic too! Thank you for joining the Floral Friday Photos meme.